From the Start menu, tap the Camera app’s tile. Camera options: Rarely used, this button switches the settings from automatic to manual. The limited manual controls rarely work better than the automatic settings. Timer: Tap this to set a three-second shutter delay, which is almost enough time to spring in front of the camera for a group shot. 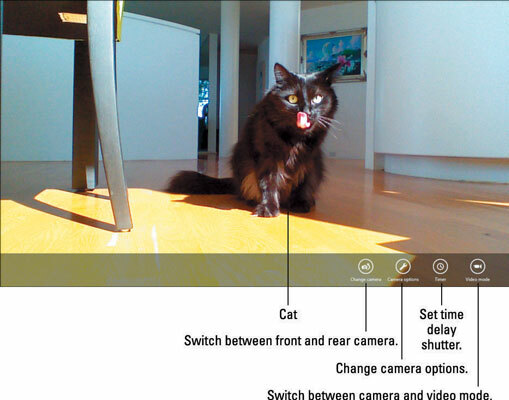 Video/Camera mode: This toggles between shooting snapshots or videos. To snap a photo or shoot a movie, touch the screen. When shooting a photo, the Camera app emits a mechanical shutter click sound, and then quickly saves the snapshot. Your new picture quickly scoots out of sight to the screen’s left edge, letting you snap another photo. When shooting videos, a timer appears in the screen’s lower- right corner, letting you track your movie’s length. To stop shooting the movie, tap the screen. To view your newly shot photo or movie, slide your finger from the screen’s center toward the right edge. That drags your photo (or the first frame of your movie) back into view. To return to shooting, slide your finger in the other direction, and the live view reappears. Crop: Tap this when viewing a photo, and a rectangle appears. Drag the entire rectangle or just its corners to frame a different portion of the photo. Tap OK to crop, and the app saves your crop as a new picture, preserving the original photo. Trim: Tap this when viewing a movie, and a circle appears at each end of the video’s timeline, shown along the screen’s bottom. Drag the circles along the timeline to mark the video’s new start and stop points. Then tap OK to save your video. Your photos and videos both live in your Picture library’s Camera Roll folder, where they can be viewed with the Photos app.